Fast turnaround on quote and work. Very flexible on customers schedule. Attends as many work related seminars to keep ahead of the changes in technolgies and what customers require. His outstanding work my house transformed it into a different house than what it was before. Troy now is my go to guy for future projects and I would give him 10 stars on a scale of 5 stars. Troy Tanner, owner of The Home Energy Detective, Inc., reached out to me last week requesting that I substantiate and attest to his years of serving the Home Performance with ENERGY STAR (HPwES) program in Northern VA. I was EPA's national manager of HPwES from 2005 to 2012 and was responsible for the enrollment and kick off of the Northern VA program. Troy and his company were in the first wave of contractors to enroll in March of 2010 and continue to participate doing comprehensive energy audits and managing the remediation. That program has evolved to become part of local Energy Alliance Program (LEAP, based in Charlottesville) and Troy has become central to LEAP's success in Arlington. I have since gotten to know Troy and his good work and have had Troy join me on several occasions to co-present at ACI National conference and local venues as well. I'm familiar with Troy's expertise in performing energy analysis and have recommended him frequently to help friends and EPA colleagues in Northern Virginia. By all accounts he is fully competent to be a licensed energy auditor in the state of Virginia. 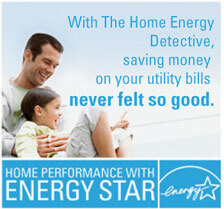 We would like to thank you for the outstanding job you and your staff did in making our home more energy efficient. The comfort level is quite evident due to the enhanced insulation elements you recommended including aeroseal in the duct work, increased attic insulation, and foam insulation in the basement and crawl space. The E-zine skylight is a real winner and the NEST thermostat is a charmer all in itself. We would be remiss if we did not mention the excellent customer service we received. Our compliments to Dan, Armando, and Mike for their courtesy and professionalism. Whenever we had an issue or question about the progress of the project, you and your staff responded promptly with an honest effort to accommodate our concerns. For that alone, we are truly grateful. Needless to say, we are very satisfied customers and would highly recommend you to any future customers. We wish you continued success in helping others achieve energy efficient homes and reducing our collective carbon footprint. It's been a while since your team completed the air seal on our ventilation system. We have noticed a definite difference in our air quality and are *very* happy we had you guys come! It was worth the money we paid, and you can freely use my name for any solitications of future work, as a happy customer. I was skeptical that it would work, but it looks like it did work well enough to make a significant improvement in our air quality! Troy... let me take this opportunity to tell you what a pleasure it was to work with Shayne. Right from the start he gave us lots of very helpful information, not only about our needs but about practical solutions. He listened carefully to our concerns about budget and prioritization. He was, throughout the process, responsive when we needed to talk, and while the work was being done. In short, he gave us confidence that we were taking the most important steps to achieve our goals. We are glad we undertook to work with your firm, and delighted that it was Shayne who was working with us.